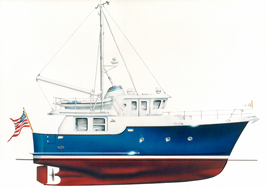 Nordhavn 4001 was built at Pacific Seacraft in California. 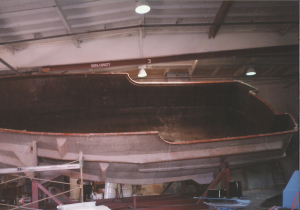 Building a fiberglass yacht, large or small, begins with building a plug with which to shape the fiberglass mold, which then is used to form the ship’s hull. Shaping the aft hull plug with a multi-axis CNC router. 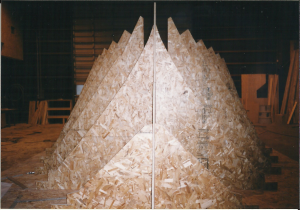 Plywood frame, used to properly shape the plug, viewed here bow-on. 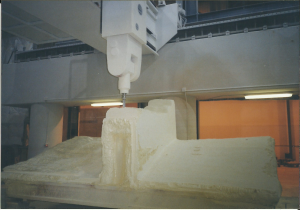 The completed plug, around which the fiberglass mold is formed. 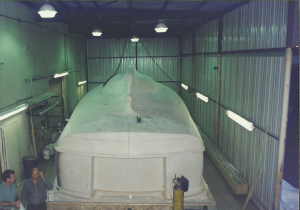 The finished fiberglass hull mold. This will be used to build multiple hulls. Once the mold is complete it is sprayed with a release agent, then the gelcoat. Over the gelcoat a mixture of plastic resin and glass fibers are applied, along with heat, to create the hull. Additional wood and fiberglass is added in places for structural reinforcement. 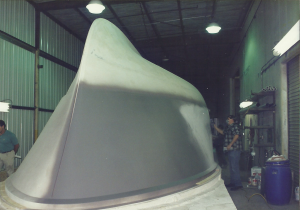 Once dried and cooled, the hull is extracted from the mold. Frank standing next to the finished hull. The engine is installed, along with the ship’s plumbing and electrical wiring. Interior cabinets and furniture ready for installation. Installing the walls and teak staving in the Master Stateroom. Lowering a fuel tank into the engine room. Frank in the engine room, now with a roof over his head. Testing the Guest Stateroom’s bunks. Lots of work going on in the Pilot House. The ship’s roof being prepared for installation. Bow roller and anchor winch installed. Ready to install the stove in the galley. Prop, four-bladed 27” bronze, and rudder. Rolling her out of the shop. Time to put her in the water.